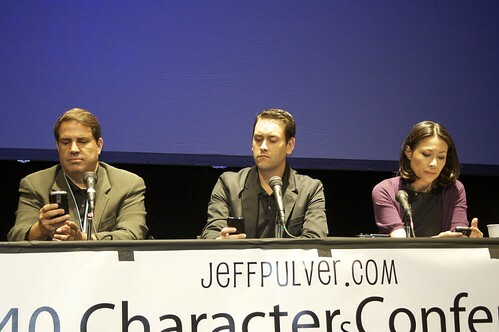 The 140 Characters Conference - Start spreading the news in old New York! While jumping on a plane to New York with 20 hours notice, Sinatra's song “New York, New York” just wouldn´t leave my mind. Everyone in the Twittersphere was talking about this event, and thanks to an article I wrote for The Next Women, I won a ticket and was lucky - to be a part of it! The 140 CC took place on June 16 & 17 on Broadway at the New World Stages, as many speakers noticed this was their first performance on Broadway, and it was indeed a fabulous show. With over 70 speakers talking in 10 minute slots, there was a vibrant atmosphere encouraged by the difference in topics, speakers and scenery. I tweeted the highlights from most sessions, and thanks to those tweets I can separate the speakers from each other. This event proved once again that there is at least 140 different ways to use Twitter, and it is up to you as a user to unfold this potential. - Was there ever a conference as this about the telephone - are we getting to precious about our tools? - Line up for your customer, instead of your customer lining up to you. - What are companies doing wrong? One way thinking - pushing their message out without understanding the media. - Thats why I use Twitter, everything I can´t get out on TV I make sure to get out on Twitter. My followers are my newspaper. - Our mandate is this: Whether you are in Tehran, Kosovo or Congo shoot that story as if it were your mother father or sister. - I think of Twitter as of what ever you want to make it - two way broadcasting. Robert Scoble - @Scobleizer: -Turned on CNN for Iran news but they showed trivial TV shows. Has CNN lost some since not affected by a disruptive force. - Few years ago we had Chief Blog Officers - now we have Chief Listening Officers. - Don't ask what is the Return on Investment, ask what is the Return on Ignoring. Twitter, the media and chaos theory Bronwen Clune @bronwen - CEO, Norg Media. - Chaos theory, making order from random information - that is what Twitter does for us. How I became a twitter character - rules of engagement Hjortur Smarason @hjortur - Editor in chief IMinnovation.org. Co-founder: IfTheWorldCouldVote.com. - When Fidel Castro can express himself in 140 characters - then Twitter has peaked. You can see more tweets from the event by searching for the hashtag #140conf on Twitter or see my tweets from June 16th. on @nfsaxberg. I wrote a 140 CC report from the event for The Next Women “The 140 Characters Conference in New York - Welcome home Tweople!” which covers further details from the conference. After 2 days I was ready to leave this amazing city, with the pleasure of meeting several fellow and follow tweeters - finally in face and even though we had unlimited characters to express our selves, somehow we only needed 140! When people ask me what the fuss is all about on Twitter, and how I can comprehend all the information, I try to explain the power of random and the tremendous source to knowledge. Twitter is a random stream of information, but the stream makes sense, because we as individuals are able to unconsciously screen much more input than we are aware of. It might seem chaotic, but when you occasionally dip into the stream, you are conscious about the topics and keywords that matters to you right now. And somehow you are able to spot those tweets that matters. I wrote a blog post in 2008 about the “Pattern of random” that received a comment on the similarity with Synchronicity (by Jung). And after reading the book it often strikes me that the phenomena of synchronicity also rules on Twitter and other social services. Somehow the topics I am working on at the moment are always supported by great links and thoughts from other users, giving me valuable sources for my work. 3 years ago I had to rely on meeting someone in the real world as in the train, at a party or over lunch. Thanks to Twitter I now need to take a deep breathe, jump into the massive pool of information, follow the stream and grasp on to everything that catch my interest. Bronwen Clune CEO at Norg Media put it this way at the 140 CC in NYC.